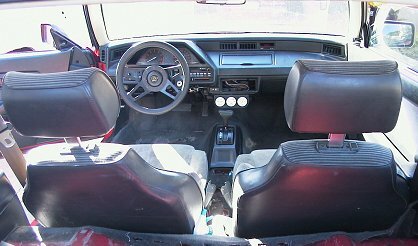 The interior is pretty stock, I ripped out the trashy carpet / fiberboard on the rear floor. I have been slowly working at removing the sound deadening tar from the rear. Up front, I made some concessions to the fact that I am 6'5"tall. 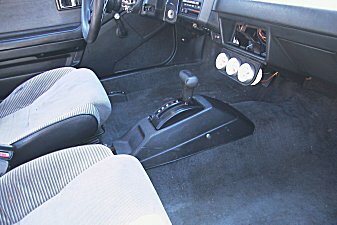 Although the CRX has more legroom than almost any car I have been in (People are amazed when they see me crawl out...so I offer for them to set in it...so far, no one has been able to touch the firewall with the seats all the way back!) I found that the seat bottom didn't offer enough recline angle for me. So I drilled some holes in a couple pieces of aluminum stock and inserted them in between the front legs of the seat and the floor. Problem solved. Next, the OEM Honda steering wheel was thin and sat too far forward. So I cut the center out of the wheel and used it as an extension to which I welded an additional plate. This plate has 3 holes drilled and tapped for my 4 spoke GT wheel. I had the wheel laying around in the basement, but, when you drill and weld your own metal, you can mount anything anywhere! Now the wheel is extended about three inches, I can finally hold on to it and still have my back touch the seat! But the wheel needs to be lower. CRX doesn't have tilt steering, but the wheel will tilt. It just requires some extensions be made for the mounting points under the dash. The whole wheel/column assembly will move down considerably. 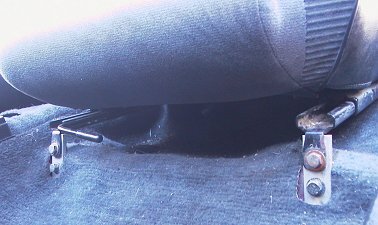 Finally, the floor shifter stuck right in my knee. I did some exploratory surgery one day...I wound up gutting the "reverse lock out" from the shifter and cutting the handle shaft down several inches. Once I stabbed the handle back on, I left it loose so I can turn it sideways and rest my knee against the long side instead of the short pointy end. 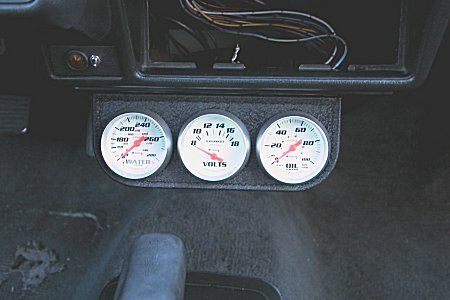 I also decided not to trust the health of my new B16 to the factory gauges and a couple of idiot lights, so I put in a triple gauge cluster on the lower dash to keep taps on volts, water temp, and oil pressure. Incase I get distracted, though I also took the time to wire up the factory lights for low volts and low oil pressure. Now, I've got two locations that can tell me if anything is wrong in the engine. You can also see the gaping "radio" hole in the dash where the local thievs took my Wal-Mart-Special Jensen stereo. At least they didn't tear anything up getting it out.